After hearing the statement, Harry, who was attending with his mother, said Australia has a black history and it was time to “set the record straight”. “In 1967, Aboriginal people were accepted as a result of a referendum and in 2017, with the Statement from the Heart, Aboriginal people asked to be heard,” he said, citing a line in the statement. The 23rd Aboriginal Members Conference – Values, Visions and Voices – was held at Teachers Federation House on Saturday, 6 April and covered important professional and industrial issues. Participants were left in no doubt about the priority of the Fair Funding Now! and Stop TAFE Cuts campaigns and their role in these campaigns in the lead up to the federal election. Karen Jones, Executive Director, Aboriginal education and Communities, Department of Education, told the conference that the relationship between Federation and Aboriginal education through the Connected Communities directorate is a growing one. Australian Curriculum, Assessment and Reporting Authority Aboriginal education adviser Joe Sambono took participants through aspects of the Australian Curriculum in the area of science, outlining his two-year project embedding Aboriginal content into the science curriculum. 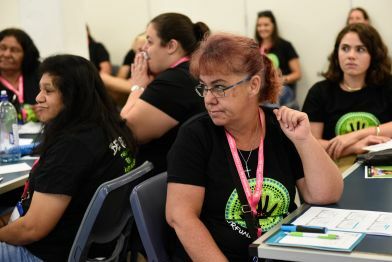 As the national curriculum is implemented throughout Australia, educators are increasingly looking at how they can incorporate Indigenous perspectives into their teaching.